The hedgerows are covered in wild roses at the moment. 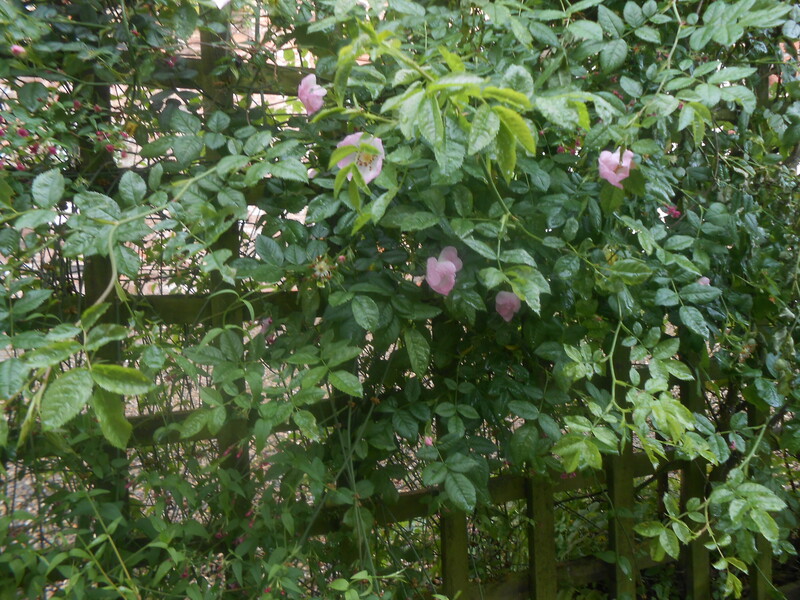 Unlike hybrid tea roses which are a bit tough, wild roses are excellent for eating. Using roses in cookery has gone out of fashion in England in the last few hundred years, though thanks to their being more common in Middle Eastern and North African cookery, you can get rosewater at Lakeland and in many delis. The Tudors, of course, were big on eating flowers, partly for colour and flavour but also because of their ‘virtues’. ‘Virtue’ meant the particular healing or health-giving properties that many plants were believed to contain. These could be physical or psychological. Books, called herbals, listed the virtues of different plants. The idea of foods being medicinal or healthy makes sense to us but it sometimes tipped over into the magical. It wasn’t just plants that had virtues – precious stones could have them too, and a jewel that was thought to have lost its virtue might fetch much less money than one that still had power, say, against epilepsy, or to protect in childbirth. Anthony Askham‘s Little Herbal, written around 1550, gives this recipe for ‘melrosette’. If you’re interested in Elizabeth I, you might also like to know that Anthony Askham is believed to have been the youngest brother of Roger Ascham, who tutored Princess Elizabeth in Greek and Latin from 1548-50. So while Anthony was writing down recipes, Roger was giving grammar lessons to the future queen. I’ve updated the spelling but left the language exactly as it is. See? You can follow a Tudor recipe! Easy! In other words, the virtue will last for five years. ‘Fair purified honey’ just means normal honey, as far as we’re concerned – it’s a reminder that in the Tudor kitchen or stillroom, things came in different states and you might have to do a fair bit of work on an ingredient before it was ready to use! ‘Melancholy’ and ‘choleric’ mean something more than just ‘sad’ or ‘irritable’. They relate to an idea which dominated Tudor medicine, that people’s health was governed by four ‘humours‘. The humours, black bile, yellow bile, phlegm, and blood, needed to be in perfect balance, and their relative quantities in your body made you a certain type of person, melancholy, choleric, sanguine or phlegmatic. Personally I think this rose syrup would be nice on ice cream or rice pudding but please don’t feed it to anyone sanguine or phlegmatic – there might be awful consequences… Notice he also specifies that you can eat it in winter or summer. 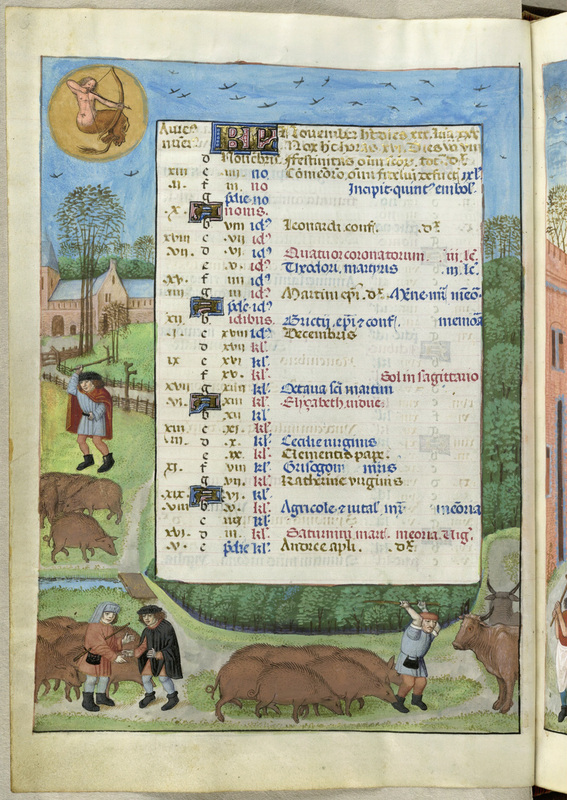 Askham was an astrologer, so he would have known that you had to eat things at the right time of year, as well as being the right type of person. Tudor nutrition was complicated…. The problem with these recipes from our point of view is that they need a LOT of rose petals. 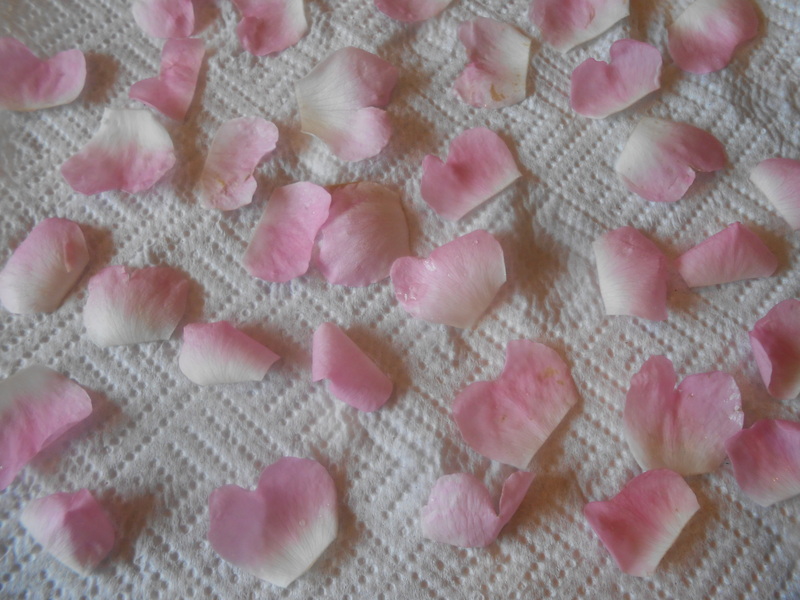 I don’t have old-fashioned roses in my garden and I didn’t want to go and strip all the local hedgerows, so I’m going to show you sugared rose petals, which you can do with just a few, and with no risk of sugar burns. There are Tudor recipes where you dip the rose petal in boiling syrup, but this works just as well. 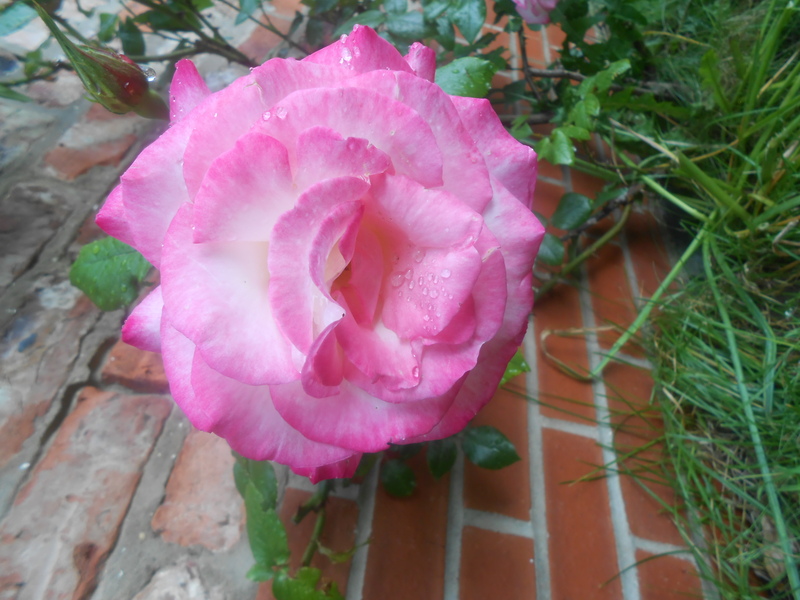 Not this sort of rose. First, gather your rose petals carefully. I didn’t wash mine because it had just been raining so I dried them by gently pressing them between two layers of kitchen roll. You have to make sure not to bruise them, because they’ll turn brown. Then use the scissors to trim away most of the white part from the base of each petal (this part is tough and tastes bitter). Spread some sugar out on a plate. Paint each rose petal with egg white, then dip or sprinkle it with sugar until it’s completely covered. Leave to dry overnight. They are crunchy and ridiculously delicious, like very delicate sweets. I used mine to decorate my daughter’s birthday cake, because she’s nine and that’s her idea of the height of sophistication. Of course, in Tudor England they would have been pretty sophisticated, because sugar was a luxury item. For this reason, the people we have to imagine using these recipes are wealthy women, who would have learnt sugarcraft as girls and carried on making sweetmeats and preserves even once they were in charge of a whole household with several cooks. 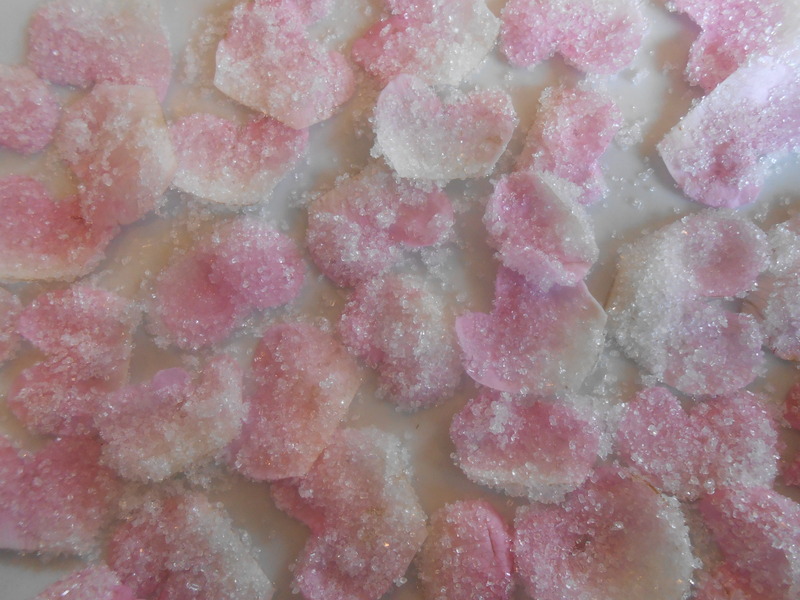 And while flavours like this are very good at evoking the sixteenth century, we’d better not forget that sugared rose petals were something most ordinary Tudor people would never even have tasted! My novel opens with a scene on a hillside, where my heroine, Nan, is hoping to see her young merlin falcon make its first kill. Good question. So I’m going to devote this post to falconry, because it’s one of these areas where the Tudors are just very, very different from us. In 21st century England falconry is a very niche hobby. (The only person I know who does it is my plumber, who flies Harris hawks.) Judging by Youtube it’s mainly practiced by middle-aged men in khaki combat gear. In Tudor England it was huge, and cut across all ages, genders and social classes. If you were poor, a goshawk could help you feed your family. If you were rich, a beautiful, big and rare bird could be a status symbol to help display your wealth, provide you with sport, and secure you another interesting dish to serve at your table, not because you couldn’t afford to buy meat but because ‘Have some plover, I caught it myself!’ is fun in the same way as we get a kick from ‘I grew it myself.’ One of my favourite details in C.J.Sansom’s fantastically well-researched Tudor murder mystery Sovereign is the elderly lawyer who lives in a York townhouse with a goshawk, which he will have taken out to the fields at weekends to hunt with. There’s a famous hawking treatise in an early printed book called The Book of St Albans, supposedly written by Dame Juliana Bernes, prioress of Sopwell Priory near St Albans in 1486. 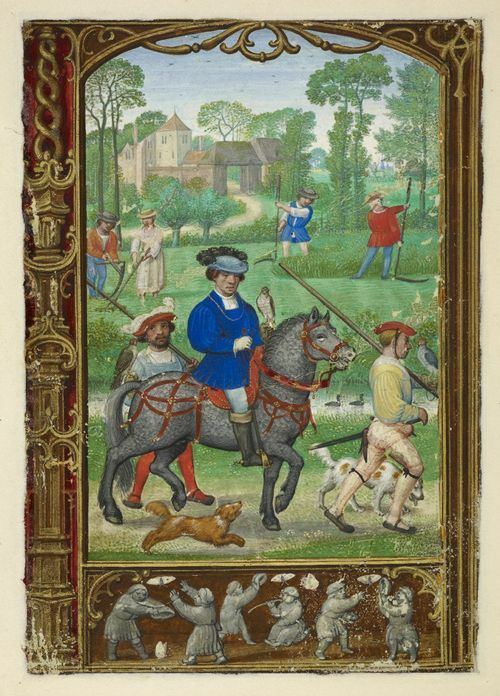 This gives a list of suitable birds to be owned by people of different ranks. It starts with an emperor – eagle, vulture and merlin, works its way down through an earl (peregrine falcon), lady (merlin) young man (hobby), poor man (tercel) and priest (sparrowhawk) and ending up, famously, with ‘a kestrel for a knave’, or servant. Actually, the list wasn’t meant to be serious. (Apart from anything else eagles aren’t particularly effective birds for falconry and nobody ever flew vultures…) There’s a letter from 1533 (September 26th, Sir William Kingston to Lord Lisle) that says ‘The King hawks every day with goshawks and other hawks, that is to say, lanners, sparhawks and merlins’ – none of them suitable for a king according to the list! What it does show us, though, is that anyone might hunt with hawks and there was a wide variety of birds used. Some will have been more expensive, better hunters and cooler-looking than others. I like to think of a bunch of Tudor noblemen comparing new falcons the way modern people compare their new gadgets like phones. They’ll have argued about which birds were best (‘Merlins? They’re rubbish! You want to get hold of a saker!’) They’ll also have compared their bits of falconry kit: the falconer will have worn a thick leather gauntlet, sometimes richly decorated, to protect his or her wrist from the bird’s sharp claws, while the hawk will have had a hood, a bell and strips of leather called jesses to tether it by. In 2013 a Norfolk metal detectorist found a vervel, a tag for identifying the hawk. It was silver-gilt with the arms of Charles Brandon, Duke of Suffolk, who was married to Henry VII’s sister – we don’t know whether the tag fell off, or whether he lost a bird that day. Either way, someone might have been in trouble – silver-gilt isn’t cheap, and some birds were valuable, especially once they were trained – James IV paid £3.10s for a goshawk. The Harris Hawk. Cool-looking but not Tudor. Or medieval. Or Arthurian. Photo by Alan Vernon. 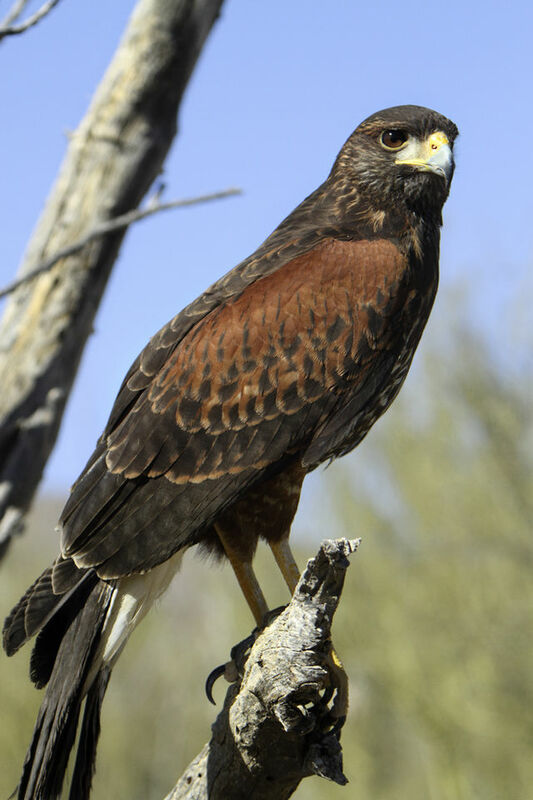 Incidentally, if you see falconry portrayed on tv and film, what you’re usually seeing is a Harris hawk. Harris hawks are big and hence look good for the camera, and they’re among the easiest and cheapest birds to get or train. But they’re American. You can imagine what the falconers who watched the 2013 tv adaptation of Philippa Gregory’s fifteenth century novel The White Queen thought about that. So how did you train a bird? What was the basic process? You would start with a young bird, taken from the nest – people will have made money climbing trees and taking fledglings to sell. As the bird learned to fly you would make sure it always came back to you by rewarding it each time, letting it fly slightly further each time, first on a tether and then freely, until you were confident enough that it would come back, that you would let if off the leash. It was important to judge the bird’s diet correctly so that it was hungry enough to want food, or it might fly off. You then needed the bird to learn to hunt without it ever realising it could just fly off and fend for itself. So it had to associate bringing prey back to you with being rewarded. Sometimes a lure was used, with meat attached to it, to get the bird’s interest. Sometimes the bird was taken out to hunt with a more experienced, well-behaved hawk, so it could copy what it did! The hawks had to be used to people, and for this reason people carried them everywhere. At a time when it was the height of bad manners to take your dog into dinner with you, hawking treatises advised owners to keep their birds on their fist at the table. Nuns were scolded by bishops for taking them into chapel. One aristocratic teenager used to keep merlins in her bedroom, where they soiled her gowns. 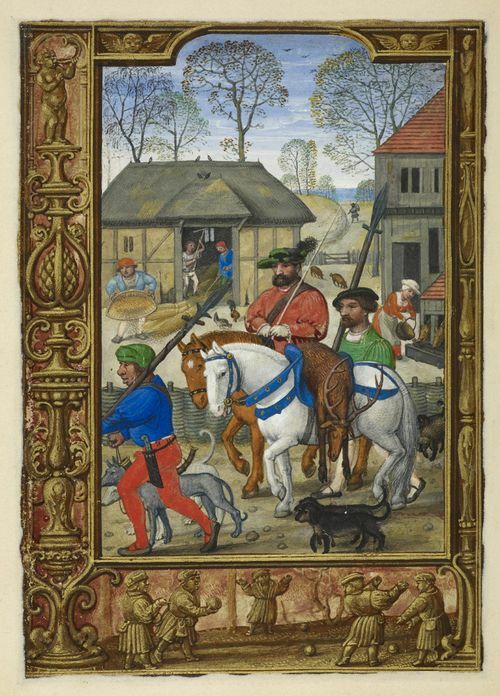 If you imagine your town in medieval times, several of the people you might meet when walking down the street might be carrying falcons, and there’s a good chance there might be a perch somewhere in your house, if you’re not rich enough to have a whole collection of birds in a mews and a proper falconer to look after them. The birds caught a whole range of prey, other birds and small mammals, depending on their size. 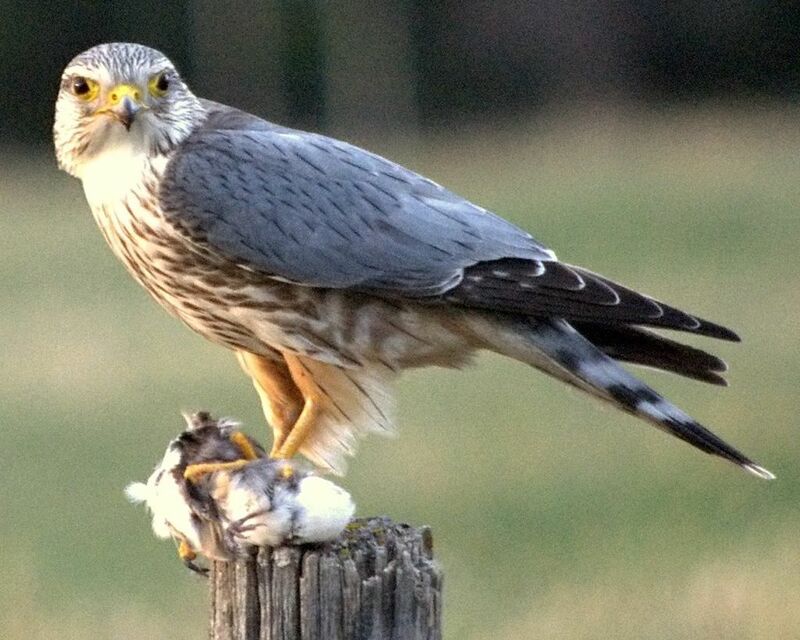 Your goshawk might bring you a hare, or even a heron – remember, the Tudors ate a wider range of meats than we do. Merlins were known for taking skylarks, which was probably more use for its entertainment value than for catching you a decent dinner – they duel impressively high in the sky but you don’t get many mouthfuls out of a lark. However, they were effective hunters of partridges, too. In the end, it was the advent of firearms that pushed falconry out of fashion, with shooting replacing hawking as a gentlemanly activity. By the seventeenth century, it was no longer part of the fabric of daily life the way had it been for many centuries before. However, there’s an increasing number of places you can go to see trained falcons. One of my favourites is Bolton Castle in Wensleydale, where the (very cool) girl falconer flies hawks in the castle courtyard, and you can admire the plumage of the other birds in the mews. Five Wounds is an adventure. It has romance, swordfighting, danger, executions, a VERY hot blacksmith, and my heroine Nan Ellerton, a sixteen year old girl with a falcon, who I hope my readers will love as much as I do. The historical reality that lies behind the book is harsher. Early Tudor England was a cruel, often frightening society. But it was also a society with a rich religious life, colourful (literally) and infused with magic. 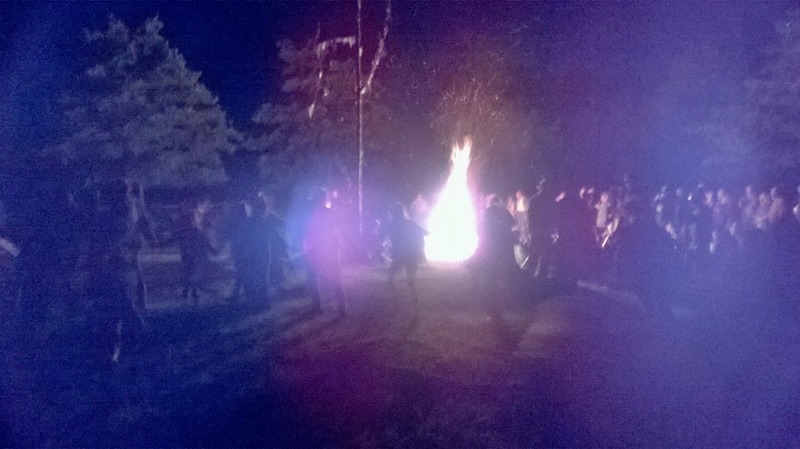 At the time I am writing about, old beliefs were being challenged and traditions swept away, sometimes by force. So how did people feel about that? Did they fight it? Well, in the north of England they did, and the rebellion that took place against Henry VIII, known as the Pilgrimage of Grace, forms the setting for my novel. The story takes place in 1536-7, when the north of England boiled over into rebellion. Nan is sixteen years old and has been sent home from the nunnery where she has been educated. Desperate to restore ‘true’ religion to England so she can avoid marriage and return to the nunnery, Nan joins the rebels.